Sloane’s froglet (Crinia sloanei) is a small (15-25 mm) threatened frog now only known from four areas in NSW. Two of the largest populations are located in the Thurgoona-Wirlinga area of Albury, and in and around the town of Corowa. The NSW Government recently funded a Saving our Species conservation program for this tiny frog. The NSW Office of Environment and Heritage (OEH) is working closely with groups to secure Sloane’s froglet in NSW. OEH, Woolshed Thurgoona Landcare Group, and Corowa Landcare Group are coordinating a community-based Sloane’s froglet survey and monitoring program. We are asking community members to help us survey and monitor Sloane’s froglet. The data you collect will help us to plan and prioritise conservation work for this tiny frog to secure its long-term future in Thurgoona-Wirlinga and Corowa. How do I survey for Sloane’s froglet? 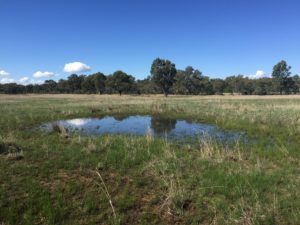 Surveying for Sloane’s froglet involves listening for calling male frogs at wetlands in the Thurgoona-Wirlinga and Corowa areas. The main survey period for Sloane’s froglet is from around June to late August because the species calls most strongly in winter (when it breeds), but we encourage Sloane’s Champions to submit their data at any time of the year! 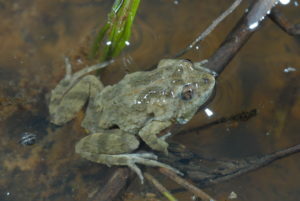 If Sloane’s froglets are present at a wetland, they are usually heard right away. However, sometimes they stop calling for a while, or other factors may influence our ability to hear them, so it is best to listen for calling males for a minimum of five minutes. It’s a good idea to survey a wetland more than once during the main survey period, and especially if the first survey did not detect Sloane’s froglet. Download the Australian Museum’s FrogID smartphone app. Use FrogID to record calling frogs at local wetlands! You can get competitive! Check out the “Top Froggers” and “Top Groups” on the FrogID website. Let’s put Sloane’s Champions at the top of the list!